Bomanite Licensee, Bomanite New England, has opened its showroom in Braintree, MA. The newly opened Design Center is approximately 1,100 square feet that displays decorative concrete systems on the floor and walls. Rotating racks displaying large system samples and designer sample boards are throughout the space showcasing Bomanite Polished Concrete, Bomanite Overlay Microtopping Systems, Bomanite Exposed Aggregate Systems such as Bomanite Sandscape, Bomanite Revealed and Bomanite Alloy. The long standing original Bomanite Imprinted Concrete can be found on the interior floor space as well as samples to view different textures. The decorative concrete wall features a sampling of innovative systems mixed with newly designed concrete graphic patterns and colors providing a custom look and feel. Bomanite New England can work with you and your clients to select a system that is perfect for your project and can customize a look that entails several Bomanite systems to fit any budget or design requirements. Take away samples are available in standard 3” x 3” chip sizes and box sets. Additional sizes in 6” x 6”, 12” x 12” and 24” x 24” are offered as well. If needed supplementary samples can be shipped directly to customers from the Bomanite’s Denver Colorado manufacturing facility. Custom samples are available with each sample cast using processes that are similar to how the concrete is constructed in the field. Bomanite Experts will show you how to create a performance based polished concrete specification. You will also learn how to turn your design intent into a successful installation, by knowing how concrete is polished and what to look for throughout the construction process. Bomanite Exposed Aggregate Systems bring the vintage decorative concrete option back into the forefront of the industry with innovative systems and longer-lasting products, combining the durability you need with the beauty you desire. Bomanite Sandscape, Alloy and Revealed will be featured. We will cover specifying and design choices during this informative session. Polished concrete. Dyed concrete. Stained concrete. Overlays. Toppings. Terrazzo. See all the Bomanite options for durable, easy to maintain concrete interiors for floors and walls. Bomanite is the leader in decorative concrete for interior and exterior applications, with Bomanite Licensed Contractors and Architectural Design Centers throughout the U.S.A. and Canada. 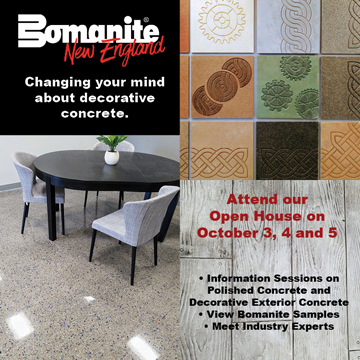 Bomanite provides the specifying community an opportunity to learn about architectural concrete paving and flooring solutions through concrete samples and educational seminars. Bomanite partners exclusively with a network of experienced and specially trained concrete professionals dedicated to the highest standards of quality and service.